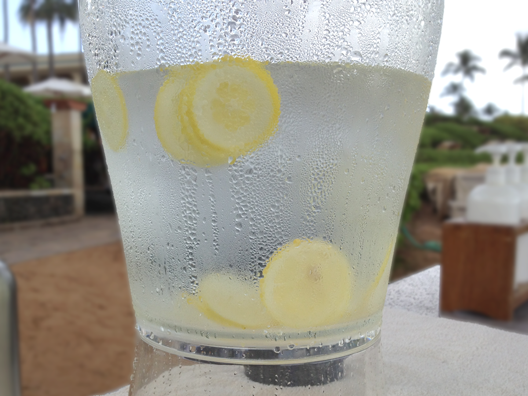 Recipe for a 2.5 gallon beverage dispenser: 1-2 organic lemons, sliced + purified water + 2-4 cups of ice. If serving outside in hot weather, add fresh ice every 1-2 hours. The infusion will lose flavor every time you add more water and ice, so be sure to replace your lemon slices every other time you fill the dispenser. Are you making this in a 32 Ball jar? If you appreciate a lot of tangy flavor, use a half of lemon. Otherwise, just use a couple of slices. If you find that the flavor is too bitter, cut the lemon rinds off before infusing. Did you know that lemons are both a weight loss aid and liver cleanser? Lemons (and limes) also contain the least amount of sugar of any fruit, so add them without guilt to your water recipes. How much lemon would you recommend using for a 32 oz. jar? Great question. It really depends on how much you like the taste of lemon. Personally, it is my favorite fruit, so I cut the rind off an entire lemon, slice it, and put infuse it in a 32 oz jar. If you don’t want to bother cutting the rind off, use half a lemon and only infuse for a couple of hours. And please check out my blog post on cutting off lemon rinds to avoid bitterness. I’m not understanding if i use ice or try to refrigerate? Do you let it sit out all day? If you use ice, do you add more during the day? You can do either method. If you are serving a large container of lemon infused water, like the one pictured, then you can add ice throughout the day. If you are making lemon infused water for yourself at home, it’s fine to put the infused water in the fridge. Be sure to cut the rind off to avoid bitterness if you are infusing for a long time. Hope that helps! Can we prepare the lemon infused water a night before? is it bad if i put too much lemon? i used 2 lemons and put it in a 1.5 liters of water. Hi, Amy is it ok let the sliced lemons infused for 2 weeks, given that you’re drinking and replenishing within that period? So sorry for the late reply to your question. No, I would not use lemon slices for that long. My max would be 2-3 days. Most of us are accustomed to drinking fruit juices that last a long time, but infused waters are not like commercial fruit juices that are loaded with preservatives to extend their shelf life. A good rule of thumb is to ask yourself: would I eat this slice of fruit if it was left in my fridge for 3 days, for 1 week, or for 2 weeks? Most often the answer will be no. Fruit disintegrates quickly, even when suspended in water. Lemon is naturally astringent and has a lot of staying power, but not more than 3 days before it starts to become susceptible to bacteria. letting your lemon stand for that long will taste bitter and will give you diarrhea just like what happened to me.. i let the infused water stand for 5 days and it gives me diarrhea learn from it. How many lemons to make 1 gallon? Hello. Thanks for this very informative article of yours. I just started using infused lemon last week and I just want to know the best ratio for lemon and water. Thanks! It really depends on how tangy you like your water to be, but I tend to use a half to a whole lemon in a 32 ounce Ball jar. I also cut the rind off before infusing to reduce bitterness. If you are in a hurry, you can start with 2 lemon slices with the rinds on and see if you like the flavor. Recepi for a gallons worth? Do you have to infuse it. What do you use if you don’t have an infuser? Wanting to make very large quantity. Serving 15 people for Mothers Day. Is it okay if I put in warm / hot water ? 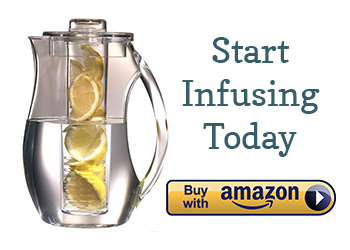 Do you need to have a infuser. What can you use in place. Making large quantity for 15 people for Mothers Day. Receipe? can you still eat the sliced lemons after it was used/infused for 3 days? I MADE A GALLON FOR MY OWN USE AND I PUT 4 LEMONS SLICED, WAS THAT TOO MANY LEMONS? IS THERE SUCH THING AS TOO MANY LEMONS? WHAT WOULD BE THE BEST WATER TO LEMON RATIO? Planning to make this using an infuser bottle. How many hours do I have to let the lemon seep in the water before drinking it? How about 1.5litre tumbler? How many lemons should i use?